As a cold front advances, a row of thunderstorms known as a squall line may form along or ahead of its leading edge. Squall lines can cause heavy rain, strong winds, hail, lightning, and even tornadoes. In a new paper, Wen et al. present the first analysis of the microscopic-scale processes, such as the formation of tiny ice particles, that occur while a squall line forms and intensifies. Understanding the microphysics of squall lines is important for estimating precipitation produced by storms, improving weather prediction models, and enhancing the accuracy of short-term weather forecasts. Previous studies in China have investigated the larger-scale structural and thermodynamic features of squall lines, but few have investigated their microphysical processes. In the new study, the research team focused on a squall line that formed and dissipated in eastern China over the course of 2 days in late July of 2014 as part of the Observation, Prediction and Analysis of severe Convection of China (OPACC) project, which aims to advance research on convective storms in China in the hopes of improving weather forecasts. The Asian summer monsoon increases the chance of squall line formation in the region, and local pollution impacts precipitation microphysics. The researchers used a Chinese-built polarimetric Doppler radar system and a disdrometer, an instrument that measures the size of raindrops, to investigate the location and size of ice and liquid particles that formed as the squall line formed, intensified, and matured. 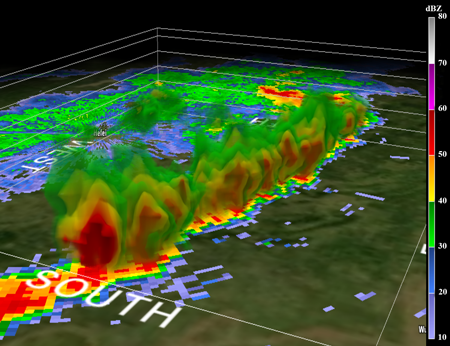 The initial stage of squall line development featured fewer but larger drops. Previous studies have linked such a pattern with squall lines in inland continental regions. However, the mature stage of the squall line featured a more maritime-like raindrop size distribution, suggesting that geographical location may not be the only factor influencing the microphysical features of squall lines. Citation: Stanley, S. (2017), The microphysics of squall lines, Eos, 98, https://doi.org/10.1029/2017EO082537. Published on 16 October 2017.